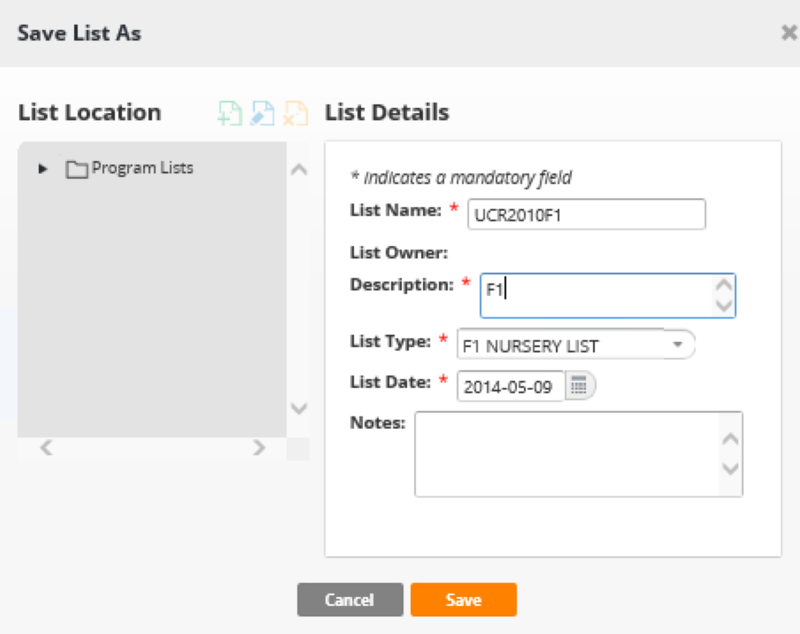 This tutorial describes the design of a series of F1 crosses and generation of the F1 nursery list. 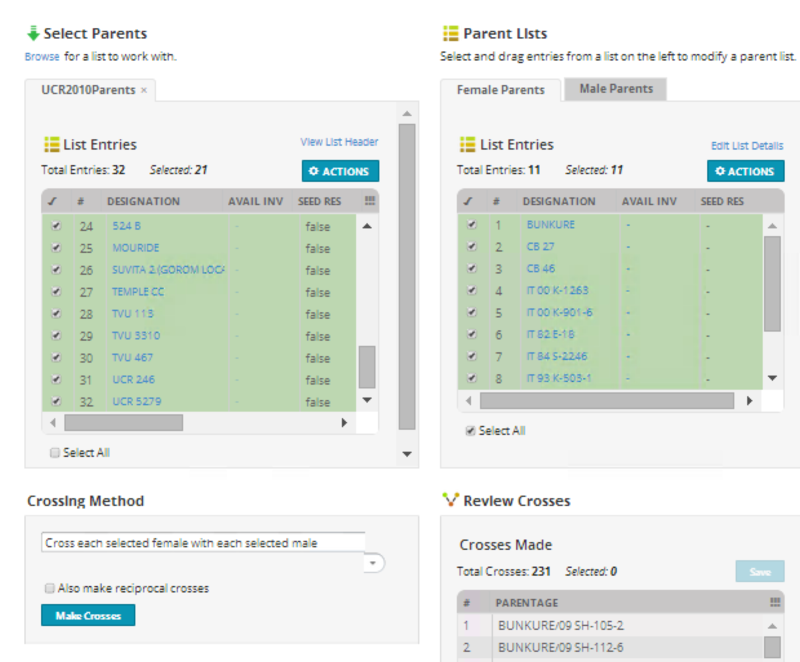 Open the Crossing Manager by selecting Make Crosses from the Breeding Activities section of the Workbench menu. Set the cross name prefix to CT10A and specify that the sequence number contain 3 digits. Each breeding program will need to develop naming conventions for crosses. In this case, designate the prefix for the cross code, CT for Cowpea Tutorial followed by a season code, 10A for the first season of 2010. Leave the current, default date to indicate harvest. If the user has not specified any Program locations you will have to uncheck the Show only favorite locations checkbox in order to see all the locations. Set the location to Ibadan. 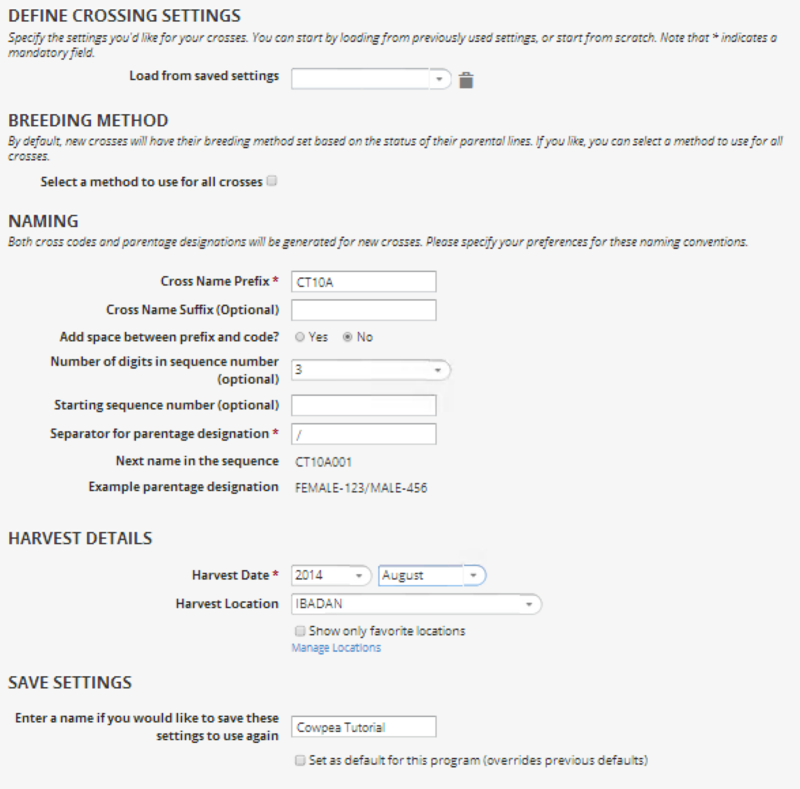 Save these cross settings as Cowpea Tutorial and select Next. 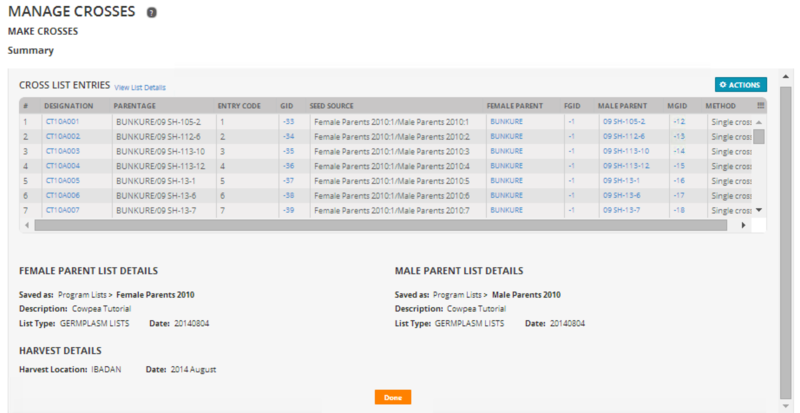 Browse for the parent list. 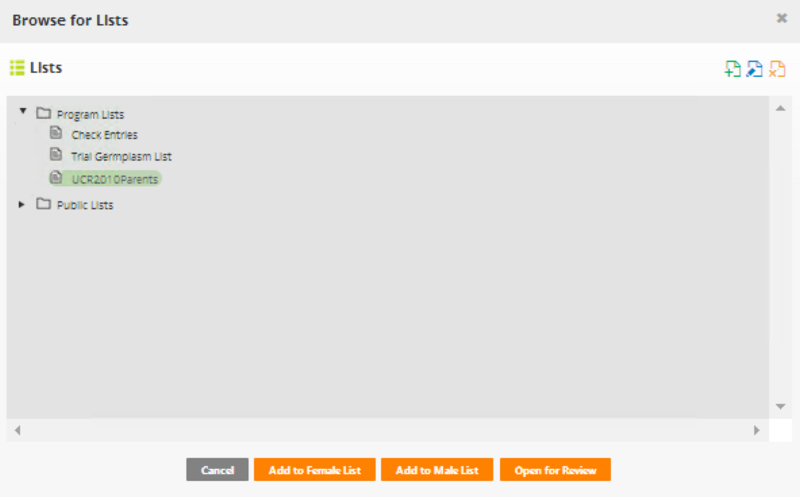 Select the UCR2010Parents list and Open for Review. Highlight and drag the first 11 entries to the female parent list box. 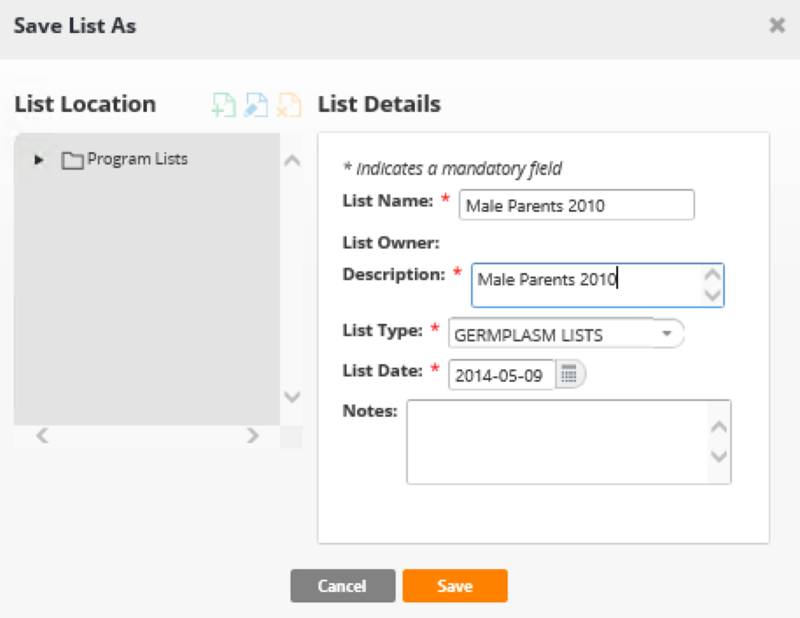 Highlight and drag the final 21 entries to the male parent list box. Select all of the entries in the female and male lists. In Crossing Method section select Cross each selected female (11) with each selected male (21) lines. Click Make Crosses. The result is 231 crosses (11 x 21=231). Save the female and male lists as Female Parents 2010 and Male Parents 2010. Save the Crossing List as UCR2010F1. Select Finish and review the summary. Select Done to exit. This work is licensed under a Creative Commons Attribution-Share Alike 4.0 International License. ?